An ultra simple pipe. I think that this will be a very good intro for folks who are not familiar with Yahoo Pipes and wish to see how Pipes can help solve their common problems. My wiki is hosted on wikidot.com and it has an auto-feed feature which reports recent changes and new pages creation via an RSS feed. I use this feed with my friendfeed account, but when I edit pages heavily via frequent saves, the list of "recent changes" makes the feed very hard to follow. 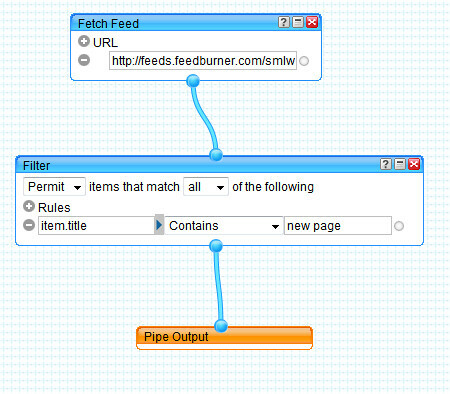 Wikidot does not provide a separate feed for new pages vs source changes, so I created this pipe to output only new pages. Some feed readers appear to have problems getting feeds from the RSS results generated by Yahoo Pipes, so I take the RSS feed and burn it with FeedBurner. Now add the feedburner feed onto FriendFeed and now there's a less-noisy feed on my FriendFeed. I do still want to include source changes though. I am working on a pipe which truncates items with the same title that were posted too close to each other.